Donkeys are very special animals. Most people have enjoyed a donkey ride at the seaside, zoo or farm at one time or another as a child, a tradition started during the Victorian times. How could anyone resist those cute sad faces, and those extraordinary long eyelashes? But donkeys are special for another reason. If you are familiar with the story of the nativity you will know that Mary and Joseph had to travel from Nazareth to Bethlehem to be counted, a journey of around 95 kilometers. This was no small distance back in those days when there weren’t any motorized vehicles. Additionally the journey was over a hilly terrain, which made the long journey even harder. Poor Mary was heavily pregnant and the prospect of such a journey must have been daunting. It’s little wonder then that she rode a donkey on this long journey. A special thing happened to the little donkey as it carried its precious load. As the donkey carried Mary and the unborn Son of God, a mark of the crucifix appeared on the donkey’s back. The top of the cross starting on the donkey’s neck and running down his spine. The shorter line of the cross ran along the donkey’s shoulder blades. The sign of the crucifix was given as a reward to the little donkey for the hard work it had endured, getting pregnant Mary safely to Bethlehem. To this day the little donkey is honored for what he did for God, and all the donkeys bear the sign of the crucifix on their backs. You don’t usually see the cross because donkeys at the beach are usually wearing saddles, so small children can ride them. 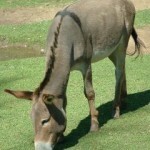 Maybe this is why donkeys look so sad, because their special mark is hidden.